[June 14, 2016] We have posted the full program along with links to the papers over on the Program page. 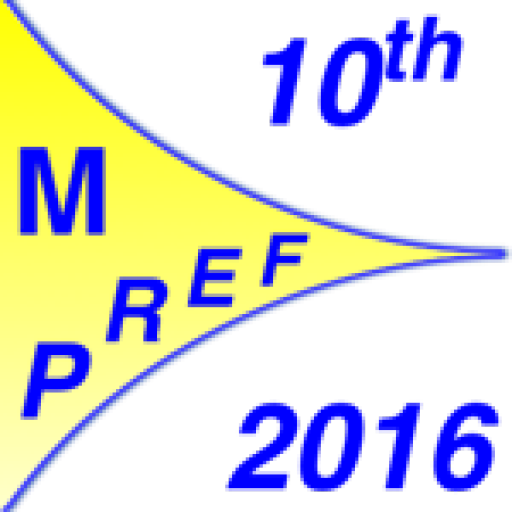 We are also happy to announce that Vincent Conitzer will be giving an invited talk at MPREF 2016! [June 5, 2016] We are happy to announce the Accepted Papers on the Program page! [May 9th, 2016] Please note that as a consequence of moving the submission deadline, Notification has been delayed till May 30th and the Camera Ready Deadline will be June 5. [April 27th, 2016] Please note we have extended the submission deadline to May 8th, 2016. Preferences are a central concept of decision making. As preferences are fundamental for the analysis of human choice behavior, they are becoming of increasing importance for computational fields such as artificial intelligence, databases, and human-computer interaction. Preference models are needed in decision-support systems such as web-based recommender systems, in automated problem solvers such as configurations, and in autonomous systems such as Mars rovers. Nearly all areas of artificial intelligence deal with choice situations and can thus benefit from computational methods for handling preferences. Moreover, social choice methods are also of key importance in computational domains such as multi-agent systems. This broadened scope of preferences leads to new types of preference models, new problems for applying preference structures, and new kinds of benefits. Preferences are studied in many areas of artificial intelligence such as knowledge representation \& reasoning, multi-agent systems, game theory, social choice, constraint satisfaction, decision making, decision-theoretic planning, and beyond. Preferences are inherently a multi-disciplinary topic, of interest to economists, computer scientists, operations researchers, mathematicians and more. This workshop promotes this broadened scope of preference handling and continues a series of events on preference handling at AAAI-02, Dagstuhl in 2004, IJCAI-05, ECAI-06, VLDB-07, AAAI-08, ADT-09, ECAI-10, ADT-11, ECAI-12, IJCAI-13, AAAI-14, and IJCAI-15. At the previous edition of ADT-15 and LPNMR-15, which were co-located, one of the conclusions was that collaboration between the two areas can be very fruitful and should be fostered. The M-PREF workshop will be a well-suited forum for presentations and discussions on this kind of research as preferences, and reasoning with them, is central to researchers in the ADT and LPNMR communities. The workshop on Advances in Preference Handling addresses all computational aspects of preference handling. This includes methods for the elicitation, learning, modeling, representation, aggregation, and management of preferences and for reasoning about preferences. The workshop studies the usage of preferences in computational tasks from decision making, database querying, web search, personalized human-computer interaction, personalized recommender systems, e-commerce, multi-agent systems, game theory, social choice, combinatorial optimization, planning and robotics, automated problem solving, perception and natural language understanding and other computational tasks involving choices. The workshop seeks to improve the overall understanding of and best methodologies for preferences in order to realize their benefits in the multiplicity of tasks for which they are used. Another important goal is to provide cross-fertilization between the numerous sub-fields that work with preferences. Preference handling in Artificial Intelligence: Qualitative decision theory, Non-monotonic reasoning, Preferences in logic programming, Preferences for soft constraints in constraint satisfaction, Preferences for search and optimization, Preferences for AI planning, Preferences for reasoning about action and causality, Preference logic. Preference handling in database systems: Preference query languages for SQL and XML, Algebraic and cost-based optimization of preference queries, Top-k algorithms and cost models, Ranking relational data and rank-aware query processing, Skyline query evaluation, Preference management and repositories, Personalized search engines, Preference recommender systems. Preference handling in multiagent systems: Game theory, (Combinatorial) auctions and exchanges, Social choice, voting, and other rating/ranking systems, Mechanism design and incentive compatibility. Applications of preferences: Web search, Decision making, Combinatorial optimization and other problem solving tasks, Personalized human-computer interaction, Personalized recommendation systems, Hybrid personalized and collaborative filtering systems, Evaluation of recommender systems, e-commerce and m-commerce. Preference elicitation: Preference elicitation in multi-agent systems, Preference elicitation with incentive-compatibility, Learning of preferences, User preference mining, Revision of preferences, Dealing with incomplete and uncertain preferences. Preference representation and modeling: Linear and non-linear utility representations, Multiple criteria/attributes, Qualitative decision theory, Graphical models, Logical representations, Soft constraints, Relations between qualitative and quantitative approaches. Properties and semantics of preferences: Preference and choice, Preference composition, merging, and aggregation, Incomplete or inconsistent preferences, Intransitive indifference, Reasoning about preferences. Practical preferences: Comparison of approaches, cross-fertilization, interdisciplinary work, tools, techniques, and libraries. Submission Deadline: May 1st, 2016 May 8th, 2016. Notification: May 20th, 2016, May 30th, 2016. Camera Ready Deadline: June 1st, 2016, June 5th, 2016. IJCAI 2016: July 9 – 15, 2016. We are happy to acknowledge the open access Algorithms Journal as a media partner for MPREF 2016.